Bennet Toman won the silver medal in the Junior division at the 2014 Canadian Figure Skating Championships. Canada’s Bennet Toman made a move from Quebec to the Toronto area back in April 2013, and the family has been thriving ever since. This past March, the family bought and moved into a new home located in the Heart Lake area of Brampton. Although the coach change was tough for the skater, he quickly bonded with Robert O’Toole. “I remember watching Bennet at nationals when he was younger and was really impressed with his ability and potential,” O’Toole recalled. Since nationals, Toman has been working on improving the consistency of his triple Axel as well as the landing positions of his jumps overall. “I have also been working really hard on my program component scores,” said the determined skater, adding that he has recently begun rotating the quad toe and Salchow. Toman’s main goals for this season are to skate two clean programs at nationals, where he will be making his senior debut. He would also like to qualify for the Junior World team. “Bennet has some pretty high aspirations and we are all eager and dedicated to assist him in achieving his goals,” said O’Toole. The 17-year-old has also been focusing on his presentation, as well as his projection towards the audience, and hopes to get both the spectators and judges more engaged in his performances this season. 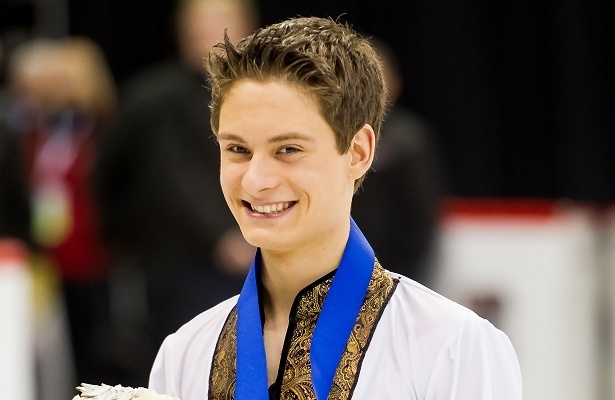 “I am going to try to present a more mature and developed skater this year,” he said. The skater will be keeping last season’s short program to Tango De Los Asesinos by John Powell, which has been reworked to meet senior requirements. His new long program will be to music from Spartacus. Both programs were choreographed by Mary Angela Larmer, while Lenore Kay cut and edited the music. When he isn’t training, Toman likes to play golf, spend time with his grandparents, and explore his new surroundings in the Heart Lake conservation area. He now has a new companion that will soon accompany him on his trail walks. Toman is competing at Skate Detroit this week, and will then compete at the Quebec Summer Championships. He was also assigned a Junior Grand Prix assignment in Courchevel, France. “I am truly excited and very ready to give it my best!” he said.